Pixies of the Forest 2 is Here - What’s New? Pixies of the Forest first graced our screens back in 2012, and instantly became a huge hit among online casino enthusiasts. With an elaborate fantasy theme which focuses on a trio of fairy characters, the game interface has always been a treat for the eye. Now, seven years later, IGT have brought the pixies back to the reels for the next instalment: Pixies of the Forest 2. With such a revered slot game, a sequel years down the line could well have disappointed fans of the original, but it’s clear that IGT have taken their time with this one and the latest Pixies of the Forest slot does not disappoint. Read on to find out what’s new and what you can expect if you take Pixies of the Forest 2 out for a spin. The original Pixies of the Forest was never disappointing in terms of graphics, but the second slot offers more refined visuals and a more detailed backdrop, which of course depicts the famous forest. The symbols, especially the character icons, are crisp and bright for a more aesthetically pleasing slot experience. You may not even notice these subtle differences unless you view the two games side by side, but still, these are welcome changes which keep the game fresh and up-to-date, meaning Pixies of the Forest 2 can keep up with 21st century slots. Pixies of the Forest has always been a simple slot, but Pixies of the Forest 2 makes playing a few rounds even more straight forward. What remains the same is that you have to play from 33 coins - this still cannot be altered. But rather than altering the coin value, then checking your total bet as you do so, you can simply edit your total bet which in our opinion makes it a little easier to monitor how much you’re betting. The game interface as a whole is just more defined and easier to read, which makes the overall user experience better. Game information such as rules and the paytable are also easier to access and more clearly signposted. Yes, the first Pixies of the Forest slot has a Free Spins Bonus, but the sequel's version is bigger and better, offering not only a Free Spins round presented by pixie royalty, but 2x multipliers as well. Better still, the Pixie Queen herself may bestow a gift upon you in the form of Symbol Eliminations, Extra Spins and Spirit Boosts (more on Spirit Boosts later). The Spirit Metre can be found below the reels, in the base game and Free Spins. The objective is to fill the metre, which is filled by one with each successive tumble. You’ll need at least three spirits to fill the Spirit Metre. So what happens when you do? One of three Feature Wilds will be triggered, which are Wild Reels, Random Wilds and Countdown Sticky Wilds. If the Pixie Queen awards a Spirit Boost, two spirits will be added to the metre. If you already have three or more spirits, Feature Wilds will be activated on the following spin. Wild Reels - turns up to two reels entirely Wild for the duration of the current spin. These Wilds remain in place if part of a winning combination. Random Wilds - Wilds are placed in random positions on reels 2, 3 and 4. A losing tumble may result in a new set of Random Wilds coming into play. Countdown Sticky Wilds - Three of these Wild symbols will be placed in random reels positions on reels 2, 3 and 4. They will be locked into place for three tumbles. If a Countdown Sticky Wild is not part of a winning combination it will be removed from the reels, but if it does contribute to a win, it will stay where it is. Now this is where the prize potential in Pixies of the Forest 2 really heats up. In the base game, you’ll notice that just above the reels are three windows displaying the current Gold, Silver and Bronze jackpot values.The Gold jackpot is essentially a progressive pot, whilst the Silver and Bronze jackpots are determined by the current bet value and will be altered accordingly. The first Pixies of the Forest didn’t contain a single jackpot, so we’re excited to see three in Pixies of the Forest 2. 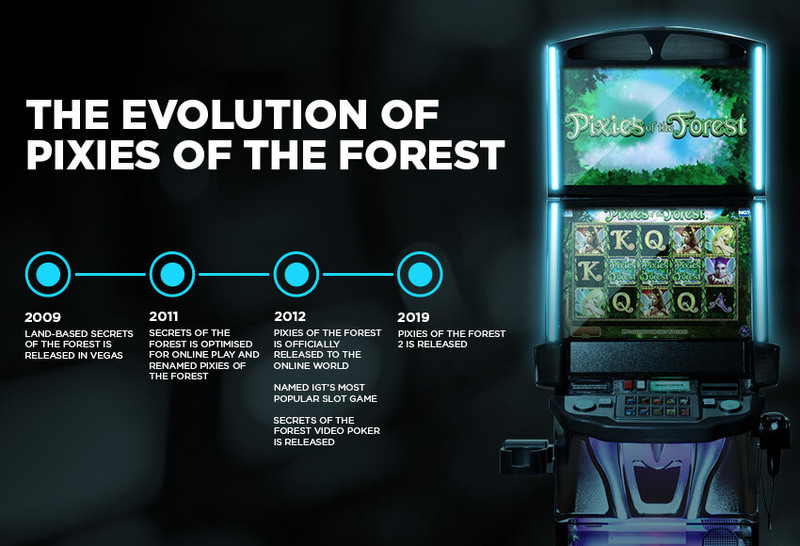 Pixies of the Forest will always be one of our favourite online slots, so we were both excited and apprehensive to find out that IGT were launching a sequel. The result is a stunning, feature-rich slot, which is a fresher, more innovative version of its predecessor. What we like about the Pixies of the Forest franchise is that there’s now something for everyone. If you like a simple slot and aren’t that fussed about having an abundance of bonus rounds available to trigger, then the original is the game for you, whilst more modern bonus-lovers will enjoy Pixies of the Forest 2. If you’d rather take a spin of the roulette wheel than the slot reels, look no further than our extensive collection of Live Casino games. From Blackjack to Poker, we’ve got your table game needs covered. All of our live casino products are playable on any device and feature the most talented live dealers, meaning you can take the casino floor with you on the move.